fslint is a Linux utility to remove unwanted and problematic cruft in files and file names and thus keeps the computer clean. A large volume of unnecessary and unwanted files are called lint. fslint remove such unwanted lint from files and file names. Fslint help fight against unwanted files by coping with duplicate files, empty directories and improper names. It is a combination of different tools that look after duplicate files, empty directories and improper name. Simple GTK+ Graphic front-end as well as command-line. Fslint cope with lint that relates to Duplicate files, Problematic filenames, Temporary files, Bad Symlinks, Empty directories and Non-stripped binaries. Help you in reclaiming disk space that were used by unnecessary and unwanted files. Installation of latest version of fslint package can be installed as easy as executing following command onDebian based systems such as Ubuntu and Linux Mint. On CentOS/RHEL based distributions, you need to active epel repository to install fslint package. How do I use fslint Command? Hope you know one of the basic rule of computation and understand the risk – have backup. Before you start testing this application make sure you have backup of everything on your system, so that even if an important file gets deleted you may restore almost immediately. Now as you know that fslint is one such application that has a command-line interface as well as a front-end GUI at the same time. You may use either. For developers and administrators, CLI version is preferred as it gives you immense power. GUI front-end is best suited to newbies and those who prefer GUI over CLI. The command line version of fslint is not on the path of most of the Linux users. You may access it at the location /usr/share/fslint/. Important: Two things you should be kept in mind at this point. First fslint don’t delete any file on its own, It just shows you the lint files, their location and their name. You have to decide what to do with them. 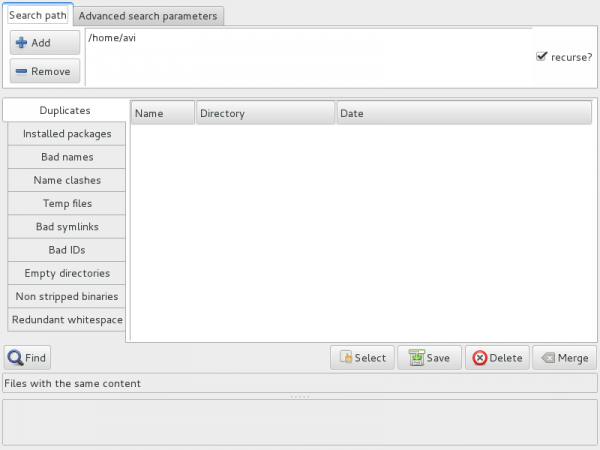 Second is fslint by default start searching from your ‘/home’ directory. You may fire the GUI Application built on top of fslint by typing fslint from Linux terminal or from theApplication Menu. Add/remove the directories to scan. Select to scan recursively or not by checking/unchecking checkbox on the top-right. Click on ‘Find’. And all done! Again you should remember, this utility do not delete the lint files but provide you with the information only and leaves everything on you. A bit slow for duplicate photo detection. Requires some improvement in User Interface.